¹ German reunification took place on October 3, 1990. The Soviet Occupation Zone (German: Sowjetische Besatzungszone (SBZ) or Ostzone Russian: Советская зона Германии, Sovetskaya zona Germanii, "Soviet Zone of Germany") was the area of eastern Germany occupied by the Soviet Union from 1945 on, at the end of World War II. It became East Germany. American forces first occupied some of the area. The Americans withdrew in July of 1945 to the agreed occupation zone boundaries. The Soviet Military Administration in Germany (German initials: SMAD) allowed four political parties to form, but they all had to work in the "All-Party Committee" (the "Nationale Front"). The Social Democratic Party of Germany (SPD) and the Communist Party of Germany were merged into the Socialist Unity Party of Germany (which became the governing party of East Germany). Finally, the SED created other parties, to weaken the Christian Democratic Union and Liberal Democratic Party of Germany. The Soviet occupation zone included the central parts of Prussia. After Prussia was dissolved by the allied powers in 1947, the area was divided between the German states of Brandenburg, Mecklenburg, Saxony, Saxony-Anhalt und Thuringia. On October 8, 1949, the part of the Soviet zone west of the Oder-Neisse line became the German Democratic Republic, usually known simply as East Germany. 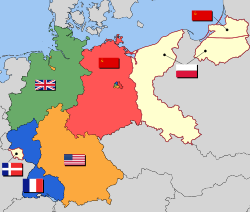 In 1952, the states were dissolved, and changed to 14 districts, plus East Berlin. 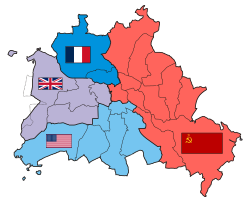 East Berlin was treated as part of the new East Germany, but technically was part of the Allied-controlled city of Berlin. This page was last changed on 11 January 2019, at 23:52.